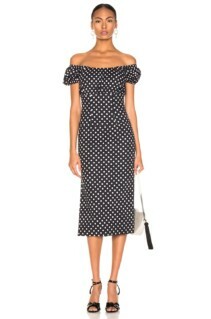 You’ll feel effortlessly chic in these elegant polka dot dresses. For a print that originated in the early 1800’s to still be so incredibly popular today, we can certainly consider it timeless. So, whether you’re stepping out for lunch or an extravagant evening engagement, polka dots will ensure a charming and classic appearance. 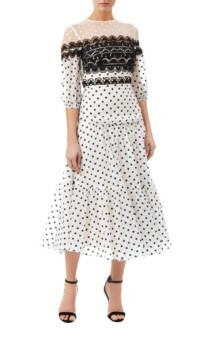 Browse our edit of stunning polka dot dresses and gowns to find your perfect printed look. You won’t regret opting for polka dot dresses at your next evening engagement. Their elegant simplicity works perfectly on these outstanding gowns and will undoubtedly add character to your look. 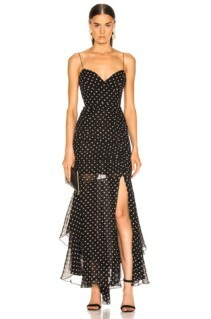 The Skylar polka-dot ruched black dress by Maria Lucia Hohan is a stunning example. Large velvet dots decorate whilst ruching on the front and back of the dress provide a shapely, fitted silhouette. Meanwhile, the V-neckline perfectly compliments a dropped back with criss-cross ribbon ties. 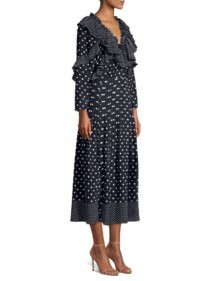 Finally, the sheer, tiered ruffle hem adds a charming and playful touch to this stunning dress. 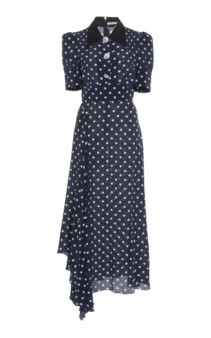 Any lover of polka-dots will simply adore the Pamela black dress by Retrofete. 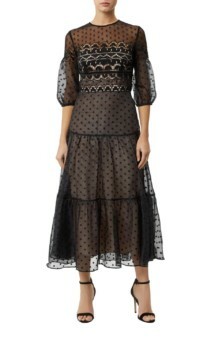 This sumptuous velvet dress introduces its polka dot pattern by the inclusion of imitation pearl adornments. This results in a luxurious finish with a great sense of depth and drama. 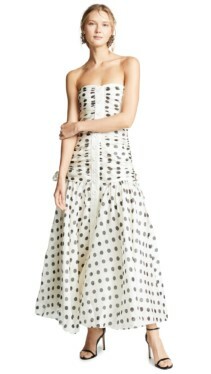 The ruffled mini skirt adds fluidity to your movement whilst the low V-neckline brings drama to the decorated bodice. Long sleeves make this dress ideal for this season which is perfectly complimented with heeled sandals and minimal styling. We are so used to seeing beautiful black, white and navy polka dot dresses, we often forget about other options. Once you see these gorgeous coloured polka dot dresses, however, you’re sure never to forget them! Wearing the Mille Punti pink polka dot wrap dress by Ariana Degreas will fill you with undeniable joy. The vibrant pink silk is decorated with delicate white dots which cover this relaxed and wonderfully flattering wrap dress in its entirety. We also love how the knee length skirt is split from hem to waistline to allow a glimpse of the co-ordinating shorts underneath. 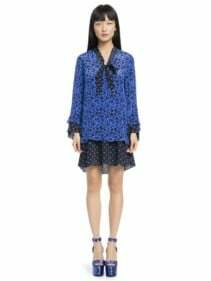 For a dress with sincere spirit and character, opt for the Wellesly blue printed dress by Alice and Olivia. This vivacious mini dress combines both floral and polka dots prints together with stunning results. The loose fit gives an eternally cool, nonchalant vibe whilst the vibrant blue demands your attention.